This section of the web is for letters, interesting comments etc from Parishioners of Kingsland, Herefordshire and for people who have left the area/local schools who want to make contact with anyone, etc. Family history enquiries are now all together on out Family History Enquiries page under History. We’re also happy to put up info about parishioner activities, fundraising etc. Please Contact Us with messages. NB we may shorten long messages or make other amendments. Would like to thank the residents of Kingsland, that participated, for Halloween trick or treat tonight. We had a small group of 6-8 yr olds with adult supervision and only respectively knocked on houses whom had pumpkins or decorations and were warmly welcomed by all. Great fun thank you! Hello -I was at Pauline Batty’s Birthday bash on the 6/10/18 and have lost my car & door key on the night and have checked with taxi no joy and police no keys handed in. I was wondering if anyone has found them. Many thanks. Many thanks from the webmaster. You will be aware of the poor and increasingly deteriorating state of Longford and North Road (B4360) through the village. Now that the spate of new building work and the relining of the sewer has come to an end,it is a good time to support our Parish Council and Sebastian Bowen, our local councillor, in the repeated requests to Hereford Council, to have the road resurfaced as a matter of urgency. I have spoken to Sebastian and he would be very happy for us residents as individuals to write to or email him, see below, stating our concerns about the condition of the road and the safety of its users. 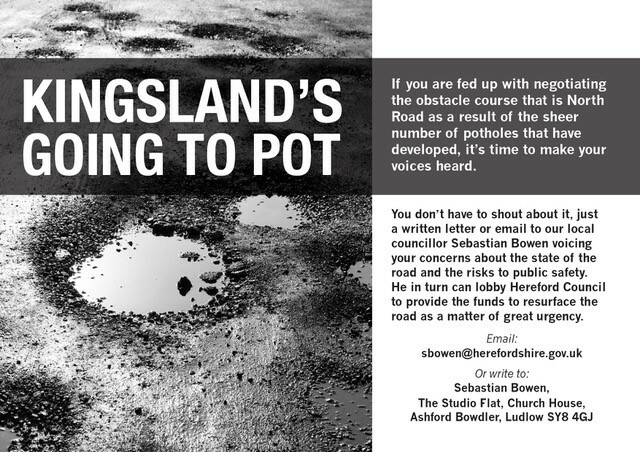 Hopefully Sebastian can use our letters to lobby Hereford Council and convince them of the need to commit the funds to resurface the road in the financial year 2018/19. Staff Nurse Ethel Saxon is named on the War Memorial in Kingsland. She was the daughter of Henry and Adelaide Saxon, who retired to Kingsland and lived at The Rosary. I believe you had a family history enquiry from their great grandson some time ago. Ethel is also named in the War Memorial at Frodsham Methodist Church, Kingsley Road, Frodsham, Cheshire WA6 6BA. The names on the Memorial were in poor condition and Ethel’s name was illegible. However, the World War War Commemoration group in Frodsham has traced the records and we now know that correspondence about Ethel’s effects went to Mrs Saxon’s sister, Charlotte Evangeline Thornton, who lived in Frodsham. The Memorial has been restored and will be re-dedicated on 3 September 2017, the centenary of Ethel’s death, at 10.45 am. If you have any contacts with members of the Saxon family, please could you tell them of this event. They would be very welcome to come – as would anyone from Kingsland who is interested in Ethel’s story. Thank you, to the very kind person who found my watch on their walk along the river this weekend. Couldn’t believe it when we found it at the gate this morning (Sunday 30.4.17). I and my brothers have brought out a book of Jill’s poems. There are about sixty of them, from various periods. Costs are £4 + p&p paperback or £8 + p&p hardback. All profits go to Kingsland village green and/or Kingsland church. I have attached one poem as a sample. If you would like a copy (or several), please drop me a line with your address. I’ll pass on my bank details. If you know anyone who might like a copy, please pass me their contact details! Some weeks ago we told you we had completed the purchase of the plot of land in St Michael’s Avenue. Border Oak commenced work on site at the beginning of July and completed the foundations and ground floor slab on programme on 21st July. Border Oak will commence work on the superstructure on 1st August and if everything goes to programme we will be moving in during the second week in February 2017. We are hoping to move from Bedfordshire at the beginning of November and will be staying with relatives in Hereford. The excavations for the foundations have generated some soil which is stockpiled on site. We will retain some of this for our garden landscaping but there will be some surplus . We would rather not send it to landfill, so If there is any one in the Kingsland area who would like to collect it, for making up ground levels or for landscaping, please let me know and we can discuss with Border Oak. A message from soon to be new residents! My wife Christina and I have just completed the purchase of a plot of land, plot 1, immediately adjacent to the Border Oak show house which has been built on Land adjacent to Westmead. It is intended that Border Oak will commence construction of our new home in June and we hope to move in in December this year. We live in Bedfordshire at present, however, Christina was born in Wellington, Herefordshire and has family in and around Hereford. We have already met a number of Kingsland residents and look forward to meeting more of you during the construction period and to becoming members of your community. After my husband and I spent 6 hours doing a litter pick up Lugg Green Road and then in a big circle. I went for a walk on the same route four days later to find that a builder had dumped a load of rubbish by a farmers gate. I was so annoyed I rifled through it a bit and found a debit card receipt. I have since reported it to Herefordshire Council and told them I have the receipt, but as yet they haven’t been back to me. Who was at Kingsland Sports day in 1948? – Can You Help?! 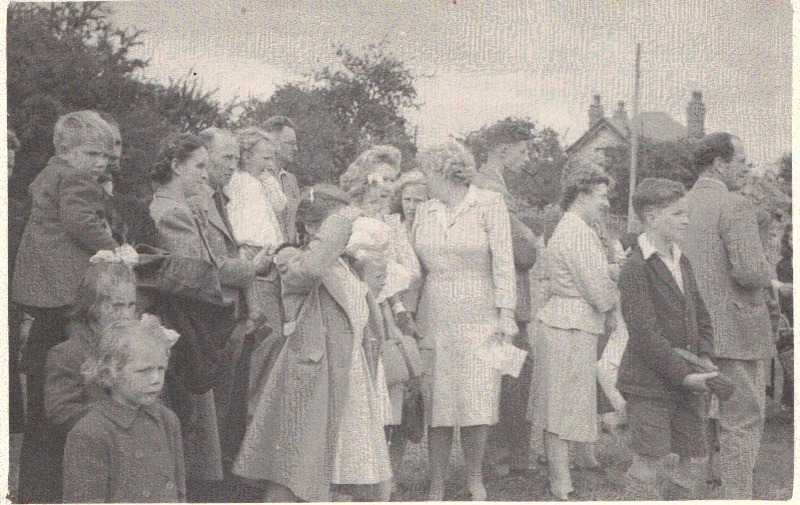 We have a great picture from Gordon Roberts showing Kingsland Sports day but it would be even better if we could identify all the people!! Can anyone identify anyone? If so please let us know by calling or mailing us via the Contact Us page. Many thanks! I’ve just moved to Kingsland and wanted to know if there are any craft clubs or meetings in the area and if not are there many crafty people who would enjoy a monthly get together to do some craft activities? Sharing crafts, learning new ones or cracking on with some of those projects that have been squirreled away. I would love to meet some local and like minded people! Please email me if you would be interested. I love to sew, knit and crochet but I also like woodwork, metal work and all sorts of handy crafts, I always want to try new things so please get in touch! Just wanted to thank the ‘White Knight’ who has saved the Post Office! Those of us who voted to save it, and probably lots of those who didn’t, are very grateful to this anonymous person. Raising money for St Michael’s Hospice. We’ve had an e-mail from Lydia Dyer and if you’d like to support her efforts her Just Giving page is here. We’ll load her picture asap. We would like to thank our dear family and friends for all their good wishes on our recent 50th Wedding Anniversary. We have very fond memories of our wedding at St Michael’s and all our lovely holidays we have spent over the years in Kingsland and Leominster. Thank you again, Ros and Pete. Simon Powney of Croft Lane Bicton and his cousin Chris Moore are in training before they cycle over 900 miles from Lands End to John O Groats in May. They are taking on the challenge in memory of their cousin Ed Moore who died aged 34 from Bowel Cancer in December 2013. Simon & Chris hope to raise £2,000.00 for the Bobby Moore foundation which funds vital research into the causes and treatment of bowel cancer. All money raised will go directly to the charity. Simon & Chris are funding the ride themselves. A set of 3 keys have been found by a dog walker from Kingsland up near Eyton Common. If you know anyone who has lost some please contact the website. Many thanks. As a young aussie tourist, I had a pleasant stay at a farm b&b in about May 1978. I also sold my Austin A40 at a motor auction house nearby (for 18 quid!!!). I wonder if the auction house is still there? Don and Marion Griffiths, who recently moved to Tamarisk, North Road from Aymestrey/Yatton held a Soup and Sandwich Lunch for friends and neighbours old and new in early March. Thank you to all who attended. £180 was raised for St Michael’s Hospice. Welcome to some new residents! Myself and my family will shortly be moving to Kingsland, renting Croftmead, on North Road. I hope to get to know you all soon. My youngest daughter Chenas (10 years old) will be starting at Kingsland primary in March so hope to meet some of the other school mums soon. On your website you show a poem about Kingsland of old, written by Mr.T.Roberts. He was my Great Uncle. I have a neatly typed copy of the poem. although I don’t know if it was the original and I don’t know the date when it was typed but it is obviously quite old. I found this in a case of papers belonging to my late Uncle Aaron. 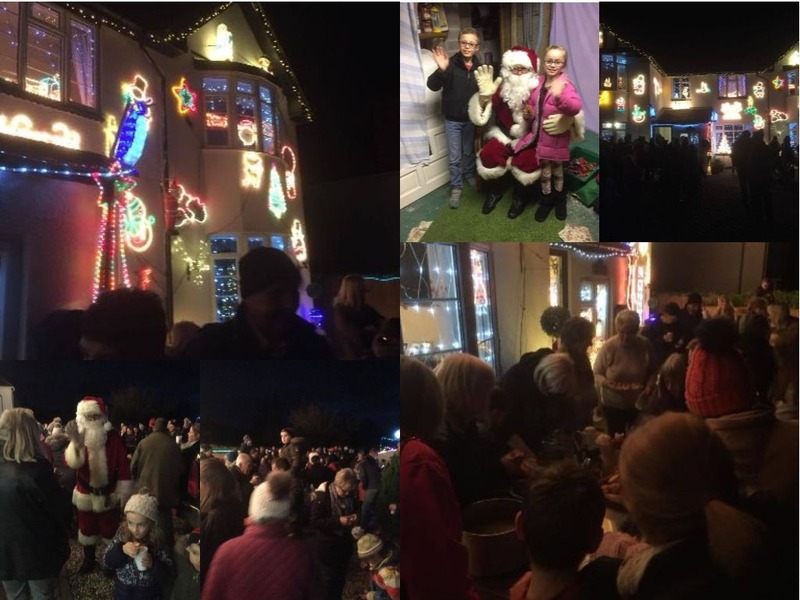 Although our beloved brass band couldn’t join us because of flu about thirty people, aged two to eighty, met to eat mince pies, drink mulled wine and sing carols around hot braziers and by lantern light on December 6th. Directed by Bryan and led by members of the choir we sang for about an hour on a clear still night. A collection amounting to £70.40 was taken for SMAAAK and the Church roof repairs. Thank you to everyone who brought mince pies and mulled wine and all who joined in, and the two young assistants who went round with the bucket! J.M. Thank you to everyone who helped make our soup lunch in aid of the Philippines such a success. To all who made soup, donated bread, cakes and raffle prizes. All those wonderful ‘kitchen and restaurant staff’, raffle ticket sellers and Linda on the door. And to all who came and enjoyed their lunch or sent donations because they couldn’t come. In all we raised £870.00; a wonderful sum that has been dispatched to the Philippines via their Embassy. J.M. Dear All, thanks to everyone who has helped Gary in Melbourne, Australia with his researches into the Red Lion, Kingsland. He is really appreciative. A reminder about Carols on the Green which will take place at 6.30p.m on Friday 6th December. Everyone is welcome and the collection will go to SMAAAK to help with the Church repairs. Carols on the Green never last long, so don’t be late! Just about 40 minutes of singing by candle light and keeping warm with mince pies and mulled wine! Prize Draw: Our most recent winners (October) were David Lloyd and Jo & Louis Geerlings. I was appalled when I went into Leominster this week and found that the toilets in the Central Car Parking area are now shut – seems to be permanent. even the handicapped toilet is now closed ! Hate to say it but will now be unable to support local shops but will shop on-line as will then not be caught short !! What future under Hereford Council ? By the way – nowhere did I see the “Use our loo” sign and why should shops provide this public service in addition to their other taxes ? What will happen when the fair is in town ? 1945: Some of the advertisers of businesses in Leominster were, W.W.Phillips, Consulting Optician, W.S.Hillman Hairdressers, Charles Norgrove for building and timber, and Cross and Bevington, Insurance Brokers. The Kingsland Young Farmers Club had a dance in favour of their own funds. Music was provided by Mr. Reg Russel’s radiogram. A bottle of wine kindly donated by Mrs Price of Stretford was won by Mr Morgan and a cake from Mrs Evans of Westfield went to Mr Patrick. At the monthly meeting of the W I a demonstration of wartime sweets and puddings was given by Mrs Woodman. The meeting opened with the singing of Jerusalem. The General Committee of the Welcome Home Fund which amounted to £521. 1s 7d was held with Colonel Mellor presiding. It was agreed, now that the war was coming to an end, that a list would be drawn up of those in the parish, currently in the Armed Forces with a view to closing the Fund and distributing the proceeds accordingly. Also an auction and sale at a fete to be held at the Rectory would take place on June 30th. Webmaster October 2013: We wish to make this page/the web more useful & interesting for local Kingsland readers. Everyone is asked to please use the Contact Us page to bring our attention to any interesting goings-on in the village which would be of interest. We will not use individual names unless an integral part of the story ! Also, we have been asked why our “Clubs & Organisations” pages do not always include the latest news. We can only put on these pages the information provided to us. Please get your secretaries/Publicity people or whoever to e-mail us with your news, information, programmes, programme updates etc. stressing to them that this service is FREE and can help encourage new members ! Kingsland Church hosts Cathedral School Choir Concert – and receives a fundraising challenge for 2014! On Friday 13th September in Kingsland Church, twenty young singers and musicians of Hereford Cathedral School Senior Chamber Choir generously gave a concert as part of the Hereford Festival of Churches Weekend. 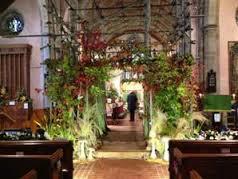 The church, already adorned with flower arrangements for the Festival of Churches weekend, was in addition festooned with autumnal trees and foliage donated by Broomy Hill Nurseries for the occasion. The Chamber Choir, standing in front of the scaffolding which is currently supporting the windows above the chancel arch, sang a variety of short choral works by Purcell, Brahms, Faure and Stanford, with passion and musicality. Some students also performed solos: the first movement of a Haydn cello concerto played by Augusta Lazenby, and the Adagio from the Mozart Clarinet Concerto, performed by Jacob Wooderson, and a Monteverdi duet was beautifully sung by Serena Linley-Adams and Jessica Price. They were accompanied by Rhiannon Davies on piano and Amalie Fisher on the organ. My dad was stationed at Shobdon Camp after the Second World War. Please do you have any information about the site and whether it was a military hospital. Any help would be appreciated. Andy. 13th September 2013: Can anyone help Andy please? Any info. please send to me and I will forward it. Thanks. Webmaster: Thanks to all who helped Andy. My brother took going to jail really badly. He has refused all offers of food and drink, even became violent. We haven’t played Monopoly since. Sign up outside local guesthouse: “Bed & Breakfast with local honey” !!! Am I the only one to be asking where have our SID’s gone or have we given up on reducing vehicle speeds through the village ? Webmaster 4th June 2013: Received this interesting e-mail this am: if anyone can help Andrew, please e-mail me and I will forward it. Many thanks. Webmaster. “Comments: I’ve only just found your website kingslandlife.com. I’m amazed at all the local historical information that I’ve been missing out on. The Bell Inn was run by my ancestors many moons ago. George Stephens and his wife Selina ran it, initially followed by Selina when George died and finally the youngest daughter, also Selina. The extent and breadth of my family involvement in Kingsland is only now becoming apparent to me. My great, great grandfather, Arnold Stephens started the Kingsland Football and Rifle Club along with Mr Sankey of the Corners Inn and another gentleman, who’s name escapes me at the moment. He also had a “bark yard” next to the railway station on the site of the sawmill. Can you put me in touch with your source for Lewis Coach builders ? My car tyres keep losing pressure. Is it that they are losing pressure via the rims ? Or via the Alloy wheels ? But why do they only go flat at the bottom? The Kingslandlife Committee are looking for someone to join the team and act as a “Village Journalist” to keep this page updated with any latest news, rumours, gossip etc.. It is good fun. Please contact one of the committee via “Contact Us” if you are interested and we will be in touch. The Web Committee wishes to thank everyone for their contributions which have helped to make the website a great success. In particular, we wish to thank all the sponsors who have contributed financially to cover costs. Remember that the web is only as good as its information. And this comes from you letting us know (via the Contact Us page) of what is going on and any changes to your programmes etc. so that everyone can be informed. What is black and white and red all over ? Answer – A Newspaper !! A soldier and sailor got into a car; who was able to drive it off ? Answer: The soldier because he had the khaki !! Arriving at a hotel in Dublin, Ryanair’s Michael O’Leary went to the bar and asked for a pint of Guinness. The barman nodded and said “That will be one Euro please, Mr. O’Leary”. Somewhat surprised, Mr O’Leary replied “That’s a very competitive price” and handed over his money. “Will you be wanting a glass with your Guinness, Sir ?” enquired the barman.